So you want to forward the email account you have setup with us to another email account, like your gmail or hotmail account? This is easy, and you can do it yourself! Use the email account you want to log into as your email in the email field (the one you want to forward), and the password we originally provided to you, or the password that you have since reset it to, in the password field. Once you are logged in, select 'Settings' in the very top-right corner of the screen in the drop-down under the three little bars (see below). A Settings popup window will appear as shown below. Select 'Incoming Email' in the left side bar on that popup. Notice that this is also the location where you can set an auto-responder under the 'Auto-Reply' tab when you go on vacation! Select 'Forwarding' in the tabs across the top of the popup. Change the status to 'On,' and input the email address that you want to forward this account to in the 'Forward to' field. 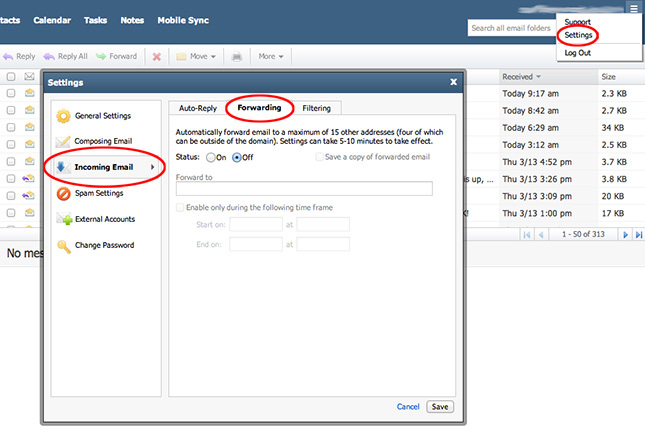 Notice that you have the ability to forward your email for a specific time frame here. Go ahead and do that if that's your intention at this time. In most cases, you DON'T want to check the 'Save a copy of forwarded email' box if you are forwarding this email account indefinitely. If you do that, then eventually your email account box will fill up on our server, and your email will stop coming to you until you log back into your account here and clean out your box. The only time it may be appropriate to save a copy would be if you are only forwarding the account temporarily. Click 'Save' at the bottom of the popup, then 'Logout' back int he top-right corner of the screen.